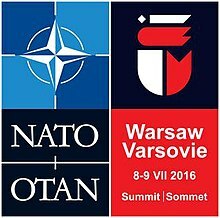 The 2016 Warsaw Summit of the North Atlantic Treaty Organization (NATO) was the 27th formal meeting of the heads of state and heads of government of the North Atlantic Treaty Organization, held at the National Stadium in Warsaw, Poland, on 8 and 9 July 2016. Polish president Andrzej Duda announced in August 2015 that NATO bases in Central Europe were a priority for the Warsaw Summit. Strengthening the alliance's military presence in the east, with four battalions in Poland, Estonia, Latvia, and Lithuania on a rotational basis – to be in place by 2017. Allies declared Initial Operational Capability of NATO's Ballistic Missile Defence to counter threats posed by Iran and further afield, North Korea, to the European continent. Pledge to strengthen individual nations' and collective cyber defences, and recognise cyberspace as a new operational domain. Start training and capacity building inside Iraq. NATO Boeing E-3 Sentry AWACS surveillance planes to provide information and intelligence to the Global Coalition to counter ISIL from Turkish and international airspace. Agreed to an expanded maritime presence in the Mediterranean Sea to cope with the European migrant crisis and human trafficking. Continue the Resolute Support Mission in Afghanistan beyond 2016, confirmed funding commitments for Afghan forces until 2020. NATO-Ukraine Commission reviewed the security situation in Ukraine, endorsed government plans for reform, agreed a Comprehensive Assistance Package for Ukraine. NATO Secretary General signed a Joint Declaration with the Presidents of the European Council and the European Commission to take partnership between NATO and the European Union to a higher level. Declaration sets out areas where NATO and the EU will step up cooperation – including maritime security and countering hybrid threats posed by a more aggressive Russia. Normally NATO summits take place every two years, but after the Warsaw summit it was announced that the next alliance summit (28th) would take place in 2017 in Brussels to inaugurate the new €1 billion NATO headquarters building. The next major summit (28th) took place in Brussels in 2017. ^ "First meeting of Inter-Ministerial Group for Preparing NATO Summit in Warsaw". Retrieved 7 July 2016. ^ "NATO Summit in Warsaw to be Held at the National Stadium". Retrieved 7 July 2016. ^ "NATO: The enduring alliance 2016" (PDF). ^ Times, Guardian, AP, and Irish. "New Polish President Makes NATO Bases in Central Europe a Priority for Warsaw Summit". Retrieved 7 July 2016. ^ "How Putin uses missile defence in Europe to distract Russian voters". NATO Review. Retrieved 16 July 2016. ^ "NATO Chief: Surveillance Planes to Aid Anti-IS Operations". The New York Times. 4 July 2016. Retrieved 16 July 2016. ^ "Warsaw Summit Communiqué". NATO. Retrieved 16 July 2016. ^ "New NATO Headquarters". Court of Audit (Netherlands) Algemene Rekenkamer. Retrieved 16 July 2016. ^ Barnes, Julian (10 July 2016). "NATO Prepares for Its Next Summits in Brussels and Istanbul". Wall Street Journal. Retrieved 16 July 2016. ^ "Afganistan a szczyt NATO". Retrieved 2016-07-07. ^ "Armenia president to attend NATO summit". Retrieved 7 July 2016. ^ Wroe, David. "Election uncertainty leaves Australia without ministerial seat at the table". Sydney Morning Herald. Retrieved 11 July 2016. ^ Mayer, Thomas; Siedl, Conrad. "Bundesheer stellt sich internationaler auf". Der Standard Österreich. Retrieved 11 July 2016. ^ "NATO summit kicks off in Warsaw". news.az. ^ "Chairman of Presidency Bakir Izetbegović attending NATO summit in Warsaw | FENA". FENA. Retrieved 11 July 2016. ^ a b "EU-NATO joint declaration". Retrieved 10 July 2016. ^ a b Rettman, Andrew. "Finland and Sweden to join Nato summit dinner". EUObserver. Retrieved 4 July 2016. ^ "Georgian delegation departs for 28th NATO Warsaw Summit". Agenda.ge. July 7, 2016. Retrieved July 8, 2016. ^ "Ireland's cooperation with Nato". KildareStreet.com. Retrieved 3 July 2016. ^ "NATO to expand cooperation with Jordan in fight against extremism". The Jordan Times. 9 July 2016. Retrieved 11 July 2016. ^ "FM takes part in NATO summit in Warsaw". Petra Jordan News Agency. Retrieved 11 July 2016. ^ "Warsaw Summit Preview: Many Interests, with Deterrence at Core". Retrieved 6 July 2016. ^ "Garčević: NATO Summit very important, the support is growing". CDM. Retrieved 4 July 2016. ^ Nusplinger, Niklaus (9 July 2016). "Nato-Gipfel in Warschau: Indirekter Kampf gegen den Terror". Neue Zürcher Zeitung. Warsaw. Retrieved 11 July 2016. ^ "Ukraine to meet with 'Normandy' partners at NATO summit in Poland". Ukraine Today. Retrieved 4 July 2016. ^ Malek, Caline. "Benefit for all as UAE delegation 'observes' Nato talks | The National". The National. Retrieved 8 July 2016.